Life has enough stress without having to worry over your hair every morning, don’t you think? If you’re hair seems to have the upper hand, especially when it comes to frizziness and fly aways, our tried and tested solutions below can turn the tide in your favor, and help you to have a good hair day every day. Almost all frizzy hair types can greatly benefit from a smoothing serum. We like Keune’s So Pure Defrizz Serum. It is quite an amazing and versatile product that can be used in a multitude of ways: It helps to smooth and control frizz during blow-drying. It defines curls when hair is air-dried, and it seals in moisture and gives intense shine to straight hair. Ingredients such as Vitamin A, E, and Argan oil strengthen your hair and scalp. As if you needed more reason to love it, it’s also paraben free with a natural fruity aroma of Orange & Palmarosa. You simply apply a small amount before, during or after styling as needed to tame frizz and fly aways. For the ultimate frizz-free, smooth style that lasts for weeks instead of just a few hours, we suggest a GK Hair Smoothing Treatment. This is an innovative service at our salon that produces long lasting results -- your hair stays luxuriously shiny and silky with unbelievable softness for up to 5 months. Unlike the majority of keratin smoothing treatments that are offered by other New Orleans salons, our smoothing service is formaldehyde free. The secret ingredient in our smoothing solution is Juvexin, a special blend of proteins and peptides that penetrate your hair and infuse it with conditioning and moisturizing benefits. This improves the softness and reduces friction enabling your hair to better withstand heat, making it less prone to breakage, and giving it better manageability. Your hair feels healthy, silky, and there’s no more frizz! Frizz is often a tell-tale sign that your hair is craving moisture. Look for a deep moisturizing shampoo and conditioner that will keep your hair hydrated throughout the day. 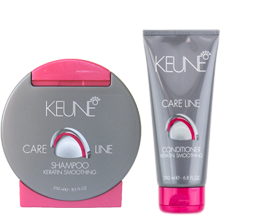 A great option is Keune Care Line Keratin Smoothing Shampoo & Conditioner. The shampoo is very mild and strengthens your hair while giving it shine and moisture. The conditioner is the perfect match for the shampoo. It contains Keratin to repair and protect, along with Provitamin B5 to restore the moisture balance, and Shea Butter to add condition and shine to lackluster hair. You get super shine, protection against breakage, and soft tangle free styling, too! Two things that can have a drying and damaging effect on frizzy hair are heat and alcohol, which can both lead to moisture loss. For best results, look for mousses, gels, and hair sprays that are alcohol free, and keep heat styling to a minimum. Look for styling options that contain negative ion technology. Negative ions neutralize the positive ions that cause static and frizziness. 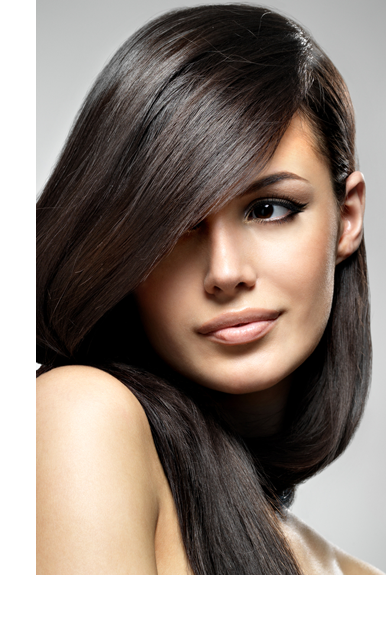 The result is hair that is shiny and less prone to frizz and static.